St. Paul said to his disciple Timothy: “I remind you to rekindle the gift of God that is within you through the laying on of my hands” (2Tim 1:6). To Titus he said: “This is why I left you in Crete, that you amend what was defective, and appoint presbyters in every town, as I directed you” (Titus 1:5). Holy Orders is the sacrament through which the mission entrusted by Christ to his apostles continues to be exercised in the Church until the end of time: thus it is the sacrament of apostolic ministry. It includes three degrees: episcopate, presbyterate, and diaconate. The sacrament of Holy Orders is conferred by the laying on of hands followed by a solemn prayer of consecration asking God to grant the ordinand the graces of the Holy Spirit required for his ministry. 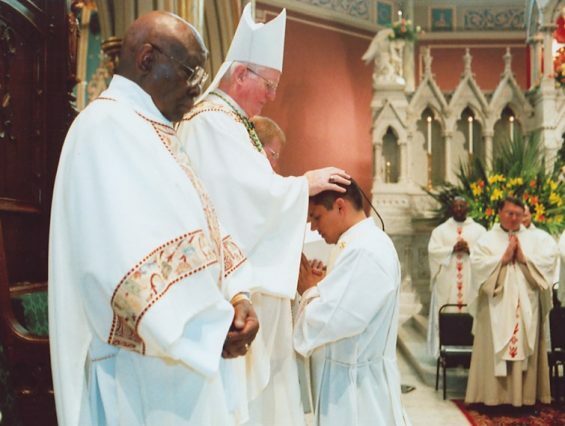 Ordination imprints an indelible sacramental character. It is bishops who confer the sacrament of Holy Orders in the three degrees. From the Catechism of the Catholic Church 1536, 1590. For more information, visit SavannahPriest, the Diocese of Savannah Vocations Office website.